Majestic has everything you need for piping for gas vents for your fireplace. There may be times when you need to replace the piping. Majestic also makes electric fireplaces that look great in any home. 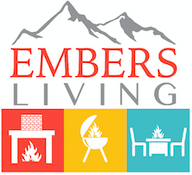 Embers Living has Majestic products of all sorts so you can enjoy the presence of a fireplace in your home. A fireplace can serve multiple purposes as a heat source or just to add decor to a room. Check out the selection at Embers Living and pick the one that is right for you.